It’s April, yet if you take a look outside you can still see leftover Christmas and holiday décor in the city. Sure, it’s been a rough winter, but listen to that nagging voice in the back of your head. 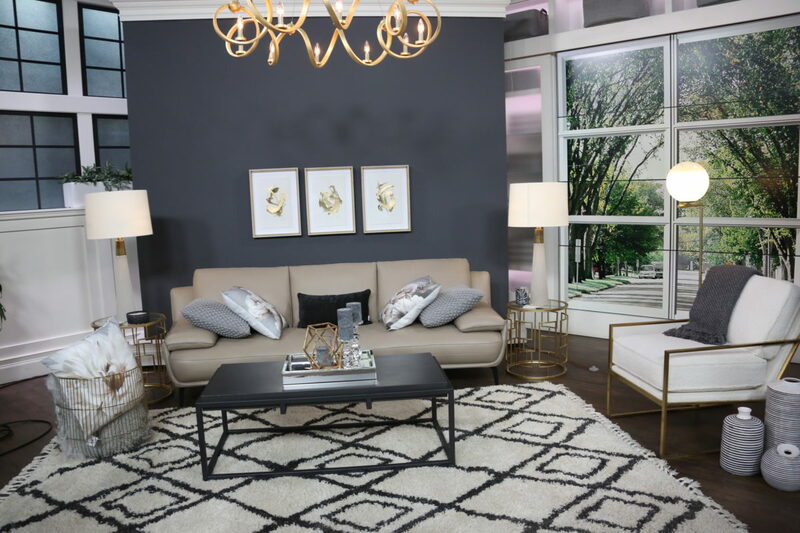 It’s time to take your home decor from winter to spring! Clear out the dead conifer, dogwood and birch planters outside and clear out the heavy winter décor inside. Cure Winter Malaise with a Shopping Trip! Before: Winter decor; plush rug, dark, rectangular coffee table, trio of framed art, neutral pillows. You may also feel reluctant to change out the heavy, plush throws and dark pillows weighing down your sofa. After all, why embrace spring indoors when there’s still a chance of random snow storms and plunging winter temperatures? I get it. But, what better way to shake off the old season and celebrate the new one than shopping? It’s time to treat yourself to a few new accessories to update your décor. You can bring the heavy stuff back later this year. When it’s cold we love to come home to our deep, plush area rugs for coziness and warmth. But why not change it up with one that is of a softer texture and light colours when the season changes? Two rugs? Seasonal décor changes? I’m not suggesting you revamp your entire house. I believe in buying quality items—like major pieces of furniture, once. But changing area rugs is actually practical, they will last longer if they’re only used every six months. 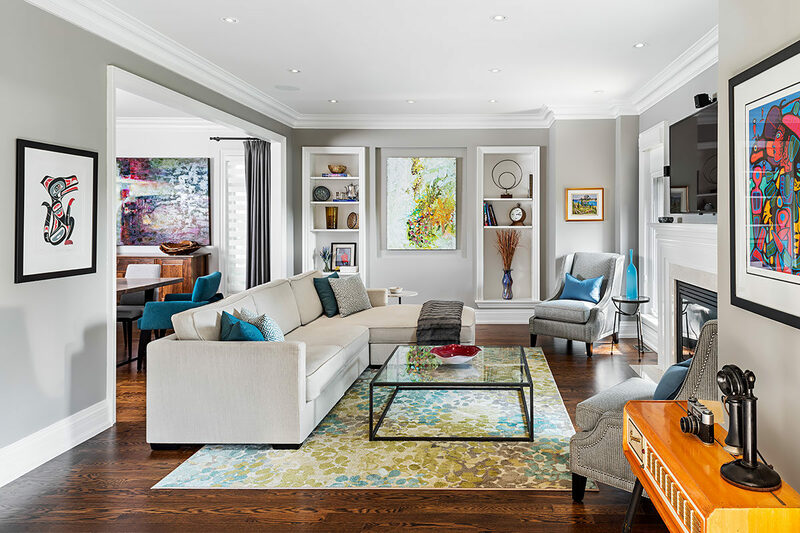 A light, spring-filled family room. How we feel and respond to texture, sheen, and weight of fabric changes throughout the year. We want to lighten up our wardrobe as the temperature rises outside and your home décor can benefit from the change, too. Colourful pillows in varying textures can transform an entire room. It’s difficult to break away from the non-colour, neutral cycle, but try a change for the warm months. Trust me, you’ll love it. While you’re at it, that heavy, dark coffee table can use a break, try switching it up to a round, light-coloured table. It will visually lighten and lift the room. 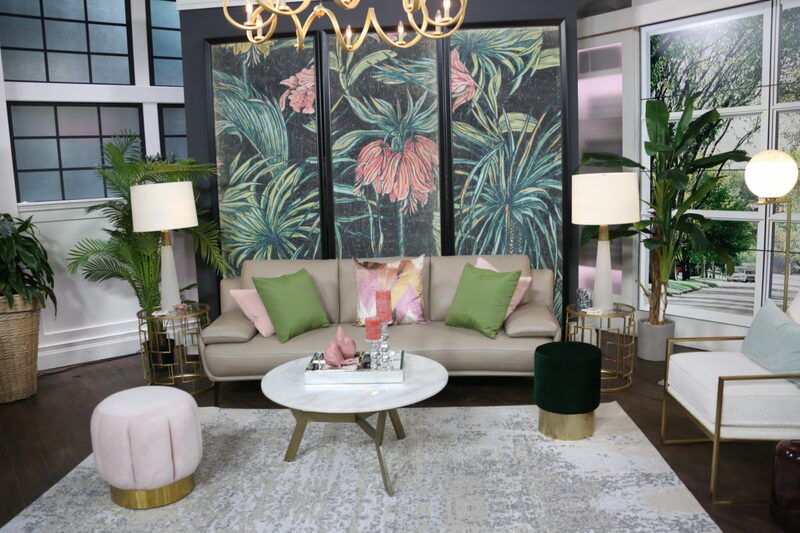 A big trend this year is to go tropical and we found the spring collection at Homesense has wonderful oversized accessories. Light-weight, over-sized, triptych panels with bold flowers and greenery can fill a wall with colour and pattern make a beautiful, seasonal accent. We‘re loving the fresh take on the ‘80’s colour palette with pinks, corals and greenery-green dominating the colour schemes. Mixed together they look stunning with gold or brass accents. The other accessory we can’t get enough of are tropical floor plants like the fiddle leaf plant and a small cluster of succulents like cacti, aloe and sedum morganianum. Just promise me if you choose to go fake, choose quality. There are gorgeous, realistic products available. Here’s a hint is you go faux: turn a blow dryer (on cool setting) on the plant outside or near a door, to get rid of the dust. Finally, when the weather starts going from winter to spring, turn off the heat and open the windows, let the fresh, warm air will blow away the cold and heavy season. Then, let your updated décor blow away you, your friends and family! Lighten up!